Small appliances such as roaster ovens are perfect for summer days when the kitchen doesn’t need more heat. Small roasters are more efficient than large ovens and conserve moisture, leading to moist finishes for cuts of meat and poultry that often dry out in a large oven. They also free up the oven during busy holidays. An 18- or 22-qt. roaster may be fine for the Thanksgiving turkey but more compact units do a better job for family diners. 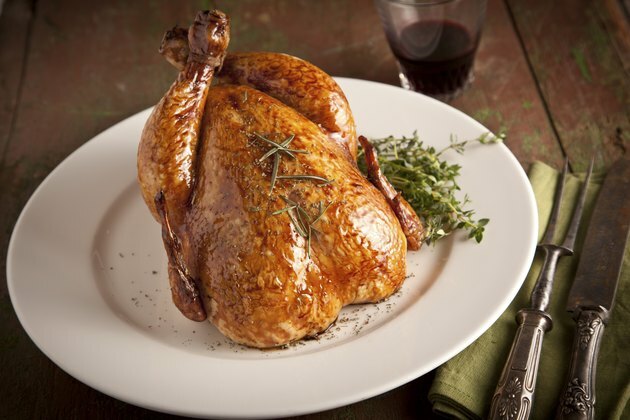 Roasted whole chicken makes an economical healthy weekday dinner. Preheat the roaster oven to 350 degrees Fahrenheit. Unwrap the chicken. Remove the giblets and set them aside or refrigerate until use. An 8-qt. oven should be large enough to hold a 4- to 5-lb. fryer or 6- to 8-lb. roasting chicken. Rinse the chicken thoroughly with cold water and wipe it dry with paper towels, inside and out. Place the chicken on the roasting rack. Pull or trim the extra fat away from the bottom opening and neck. Roasters will have more fat. Fold wing tips behind the bird’s back for stability in the roaster. Rub the chicken inside and out with a prepared rub or with salt, pepper and garlic. Other seasonings might include sage, rosemary or celery salt. Don’t stuff chickens; instead put a stick of celery with some margarine, a lemon or lime cut in half in the bird. Drop the roasting rack slowly into the roaster and replace cover. Roast fryers under 5 lbs. for 15 to 17 minutes per pound and roasters under 8 lbs. for 18 to 20 minutes per pound. Roasters do not require any basting. Check the bird with a meat thermometer between 20 to 30 minutes before it should be done. Test with an instant-read thermometer on the inside of the thickest part of the thigh, avoiding any bone. Add a finishing flavor such as citrus, teriyaki or Italian dressing, if desired. Take as little time as possible and replace the lid quickly to conserve heat. Roast until the chicken thigh reaches 165 degrees, then pull the roaster rack out and slide the chicken onto a platter to rest for a few minutes before cutting. Use the pan and platter drippings for gravy. Marinate chicken in teriyaki, Italian dressing or other seasonings for several hours before cooking or brine chicken in a solution of water and 1/4 cup of Kosher salt for no longer than six hours for a tender chicken. Always use nonmetal containers for marinades so that salts and acids can’t interact with the container to affect the taste of the finished dish. Never use marinade used on raw poultry to baste while cooking. Always use fresh marinade or chicken broth to avoid restoring bacteria from the raw to the finished bird. Clean surfaces, plates and utensils used on the raw bird with soap and hot water; wash hands with soap and hot water before any other food preparation. Wear oven gloves or use pot holders when handling roaster lid and pan and unplug roaster before removing its contents. United States Department of Agriculture: Is It Done Yet?